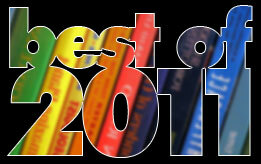 This is the crime fiction (part I) segment of January Magazine’s Best Books of 2011 feature. You can see other sections as follows: Best Fiction, Best Non-Fiction, Best Art & Culture, Best Biography, Best Books for Children and Young Adults, Best Cookbooks, Best Science Fiction/Fantasy and Best Crime Fiction (part II). Fogtown came out in 2010. Falling Glass is McKinty's 11th novel not his sixth. Even if you only wanted to count his novels for adults then FG would be his seventh. Thanks for the heads-up, Brian. Both of those reviewlets have now been amended. What Do Your Favorite Books Say About You?